ClotIt™ is a brand new, non-staining, blood clotting powder made up of all-natural minerals designed to rapidly stop bleeding in minor to severe external wounds. ClotIt is a patent-pending, triple-action compound of all-natural minerals. Upon contact with blood, ClotIt™ facilitates and accelerates the body’s natural coagulation cascade, while simultaneously slowing blood flow, by constricting local vessels and capillaries. ClotIt’s™ fine granules rapidly absorb plasma at the wound site, leaving behind platelets and blood cells, to aid in forming a solid clot. 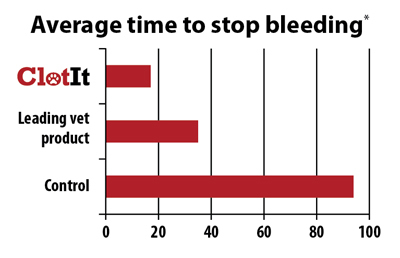 This triple-action process results in complete clotting in seconds.